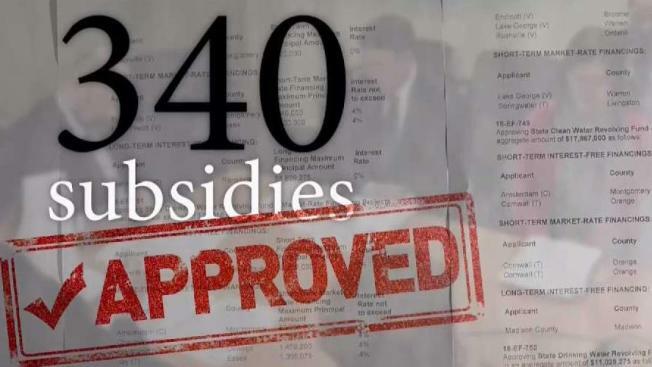 Three hundred forty tax subsidies requested. Three hundred forty tax subsidies approved. An I-Team analysis of the Public Authorities Control Board, a little-known but powerful New York State financial regulator, shows the oversight body rarely turns down requests for public money. In fact, between January 2017 and November 2018, the PACB approved $42 billion worth of grants, loans and government-backed bonds. Not a penny of requested money was denied. Last month, the Democrat-controlled Senate nominated Gianaris for one of three voting seats on the PACB, but Gov. Andrew Cuomo declined to confirm the nomination. It was widely believed Cuomo blocked the nomination because Gianaris fiercely opposed the $3 billion in tax incentives in the governor’s favored deal to bring a new Amazon facility to Queens. Had Gianaris been approved to sit on the PACB, he said he would have voted against the Amazon deal — and would apply more scrutiny to the hundreds of other corporate subsidies that routinely come before the Board. Just this week, the PACB approved giving $1 million in public money to Million Air, a private Texas company that operates a new luxury terminal and hangar for private jet owners at the Westchester County Airport. Jonathan Wang, a private pilot who formed the group “Citizens for a Responsible County Airport,” said giving $1 million to a company that services well-to-do private jet owners is a waste. •	$1 million to redecorate Cadillac's global headquarters in SoHo. Shortly after winning the grant, Cadillac declined the cash and moved its offices back to Michigan. •	$1.1 million for Super Dirt Week, a series of dirt track races in Oswego, New York. •	$400,000 to help pay for a South American penguin exhibit at the Niagara Aquarium. •	$875,000 for a film studio near Syracuse. The grant was on top of $15 million in state money that helped build the facility. Two years after the award, the head of SUNY Polytechnic, the project sponsor, and the developers who built the building were convicted of wire fraud and conspiracy in an illegal scheme to rig the bidding process for the film hub. Jack Sterne, a spokesperson for Empire State Development, the Cuomo Administration's lead economic development agency, said all the subsidies approved by the PACB create jobs and attract tourism dollars — often to regions of the state that need revitalization. “ESD has thousands of projects, and while you can cherry-pick a handful to fit a pre-determined narrative, the facts show our holistic approach is working and our investments are paying off for New Yorkers,” Sterne wrote in an email to the I-Team. Recipients of the public money had similar positive reviews. Geoff Thompson, a representative of Million Air, defended using state money to subsidize the private jet business. In order to win the $1 million, Million Air pledged to create 27 new jobs. Brian Carter, CEO of World Racing Group, the company that runs Super Dirt Week, said his event is well worth the public expense because it attracts significant crowds to Central New York. “All of our studies indicate the positive economic impact is somewhere between $10 and $12 million on an annual basis,” Carter said. Gary Siddall, Executive Director of the Niagara Aquarium, said grant money for the penguin exhibit helped his facility increase attendance by 35,000 visitors —a 10 percent jump over the prior year. “We were at risk of losing the project if it wasn’t for the injection of funds from Empire State Development,” Siddall said. Despite Cadillac’s move back to Michigan and the scandal surrounding the Central New York Film Hub, the Cuomo Administration defended those projects as well. ESD stressed that Cadillac created 80 jobs during its four years in SoHo. In 2014, Governor Cuomo said the film hub would create 350 high-tech jobs. His administration declined to say how many have actually materialized — but did say the movie studio is currently hosting film and commercial productions that create "continuous indirect jobs." Assembly Member Amy Paulin, who currently holds one of three voting seats on the PACB, said it’s unfair to call the Board a rubber stamp. She argues the legislation that created the PACB forbids her from vetoing a subsidy just because she doesn’t agree with the policy behind it. “I don’t think that anybody would want to see me as a Westchester County legislator combing it to say, 'Okay, there is no project in Scarsdale on here, so I’m vetoing everything. There’s no project in White Plains so I’m vetoing everything,'” Paulin said. Freeman Klopott, a spokesman for Cuomo’s Budget Office, echoed that interpretation of the PACB statute. But the PACB has blocked projects in the past, based solely on political considerations. In 2005, when Mayor Michael Bloomberg proposed using public subsidies to help build a new sports stadium on the West Side of Manhattan, former Assembly Speaker Sheldon Silver — who sat on the PACB — scuttled the idea with one vote. Comrie did not return the I-Team’s request for comment. The governor’s office has not said whether Comrie will be confirmed.